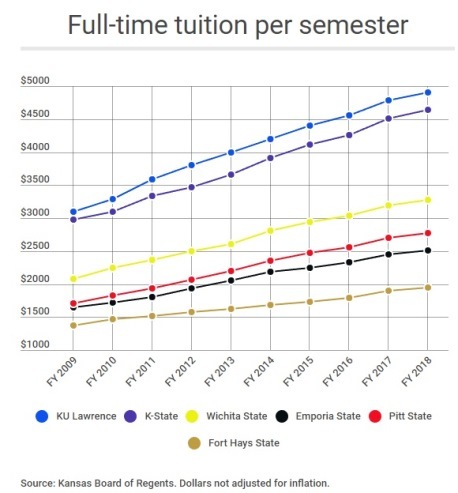 As tuition rates increase at Kansas Regents universities, state spending per student slides – Welcome to Wyandotte Daily! Board members expressed reluctance to approve the latest round of tuition hikes during their meetings last week — and a few voted against them. In hours of discussion and deliberation last week, the regents worried about hindering would-be first-generation college students — a group that public universities have been courting amid ambitious goals to boost the rate of Kansans who obtain higher education degrees by 2020. The regents wondered whether the burgeoning cost of postsecondary education makes sense in light of the salaries that many graduates can expect to earn in professions like teaching and nursing. A Kansas Department of Labor survey put the average starting salary for an elementary teacher in Kansas around $35,500 in 2015. For a registered nurse it was about $43,300. Regent Ann Brandau-Murguia, a resident of the Argentine neighborhood in Kansas City, Kan., was among those on the board who called for lower increases than were ultimately approved. But Kansans who head to college today do so in an environment where regents universities depend more on tuition and fees than state appropriations to pay the bills. That has been the case since 2012, and the gap has steadily widened. In 2016, tuition and fees provided more than $9,600 per student and the state general fund provided about $7,100. A decade ago, tuition and fees brought in $6,300 per student and the state put in about $9,600. The average 2015 college graduate in Kansas left school with just over $28,000 in debt, according to an analysis of available data by the Institute for College Access and Success Project on Student Debt. That’s higher than averages in all four neighboring states, which ranged from $24,900 in Oklahoma to $27,500 in Missouri. The tuition hikes for next fall are, percentagewise, the lowest in a decade. Year-to-year increases have often topped 5 percent. In making their case to the regents this week, the university presidents said the tuition increases would cover only part of the needs at their institutions, where utility bills, state-mandated pension contributions and other expenses are on the rise. A slide in enrollment has compounded the situation at K-State, but all six state universities have experienced declining state aid per pupil. In 2010 the regents launched a 10-year agenda to reach a 60 percent postsecondary degree and certification rate among Kansas adults by 2020, citing economic research on changing job markets and workforce demands. Though more Kansans are continuing their educations after high school, the state is not on target to reach the 2020 goal. Meanwhile, university budgets were trimmed in recent years amid a tailspin in state revenue that at times prompted Gov. Sam Brownback and the Legislature to change course midyear and pull back on spending. Last year the university system lost 4 percent of its budget. 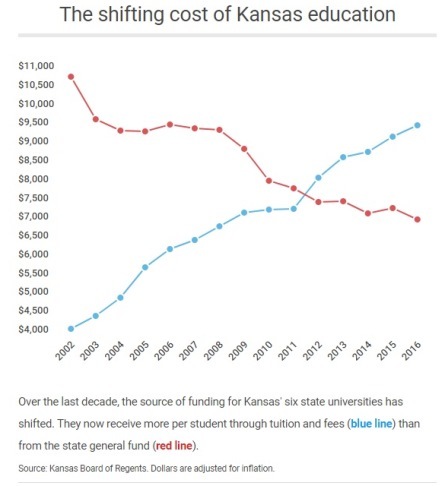 This month — after scuttling Brownback’s signature 2012 tax policies to raise an estimated $1.2 billion in extra revenue — the Legislature agreed to restore in the next two fiscal years about a quarter of what the universities had lost. Brandau-Murguia took that as a sign Kansas should start tackling the rising cost of higher education.